The DCI has announced their quarterly updates to the Banned and Restricted lists today, and Deathrite Shaman has been Banned in Modern, while Bitterblossom and Wild Nacatl have been Unbanned in Modern! There are no changes in any other format. 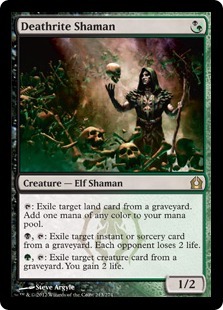 While BGx decks have been putting up very strong results over the past 6 months in Modern, the banning of Deathrite Shaman seems premature, especially in light of the changes the Modern metagame will see as Wild Nacatl and Bitterblossom are unleashed into the wild. It was obvious that the banning of Wild Nacatl was probably unnecessary, especially when compared to other options like Delver of Secrets, which does as much damage and flies, and just happens to be Blue. The most interesting thing to see will be what becomes of Bitterblossom, which has the potential to fit within a variety of decks and strategies. With the common presence of cards like Abrupt Decay and Qasali Pridemage in Modern it is unlikely to show the dominance it once exhibited in Standard many moons ago. 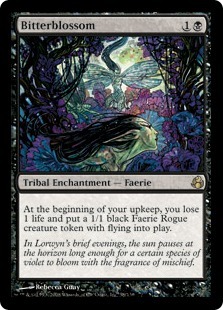 It is comparable to recent printings such as Lingering Souls, which is bordering on playability in the current metagame, as 1/1 tokens are just not that relevant when facing down threats like Birthing Pod, Splinter Twin, Karn Liberated, and Valakut, the Molten Pinnacle. What has been demonstrated over the past year is that Modern is still an underexplored format, and the most recent changes will just add more options to the field of the upcoming Modern format Grand Prixs and Modern PTQ circuit later this year. While there has been much discussion recently of potential Unrestrictions in Vintage, or the possible Banning of Show and Tell in Legacy, ultimately nothing came of them. Vintage and Legacy are still very healthy formats overall, and nothing has demonstrated dominance that would merit shaking up either format. Eternal players will have to continue to wait until more cards eventually are peeled away from the Vintage Banned & Restricted list, as the relics of bygone eras of powerful decks and questionable DCI decision making still sit awaiting freedom.